Undercover Investigation Shut-Down Ale takes its name from an incident in 2005, when undercover California Alcoholic Beverage Control agents busted the brewery on charges of "disorderly house" and "moral turpitude" when they found people smoking weed on brewery premises. The organization revoked the brewery's license, and they ended up enduring a three week suspension (during which they installed a new bottling line). Lagunitas refer to all of this as the "2005 St. Patrick's Day Massacre." This beer is a nice little middle finger the California ABC, and yet somehow won label approval from them. If you end up trying this one out, I recommend you read the ramblings on the bottom of the six-pack holder, though they might make more sense if you read it after drinking some of the contents. 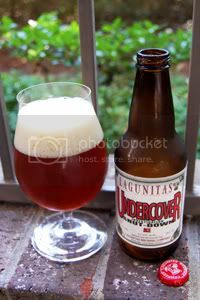 Undercover is categorized by the brewery as an "Imperial Mild," which they freely admit is an oxy-moron. Since that style doesn't really exist, I (as most others) have classified this as an American Strong Ale. The American Strong Ale style is a bit of a catch-all, but I think it works for this beer. You could probably make a case for this being a Double IPA, as the lines can be pretty blurry. But, with just 72 IBUs, I'm sticking with American Strong Ale. But that's all just splitting hairs—what really matter is how it tastes. Appearance: A beautiful red-orange body with two fingers of off-white head that leaves good lacing. Aroma: There's a flood of hops the second the bottle is opened. The hop profile is intense and smells grapefruity, piney, and almost candied. Underneath all of this there's lots of sweet, almost syrupy, malt. Taste: It's much the same in flavor. A hardy does of grapefruity and piney hops over a big, sweet malt backbone. Most of the alcohol is hidden rather well, and what remains is pleasant. The aftertaste keeps the hop-fest going. Mouthfeel: Medium-full bodied with good carbonation and a little alcohol in the throat. It coats the mouth well, allowing for some great aftertaste retention. Drinkability: Despite the high ABV and large flavor profile, this still goes back relatively fast, giving this above-average drinkability for the style. Verdict: Since Laguintas has quite a full lineup of American Strong Ales, one would expect them to be pretty good at crafting them by now. So, it's no surprise that Shut-Down is a solid example of the style. It's may not be the most intense or interesting Strong Ale out there, but it's tasty, quite drinkable, and features an interesting focus on hops. Note: While this review is being published in September, the tasting notes contained within were taken when the beer was fresh this past March.